Not sure how many calories in a banana? Do not worry! 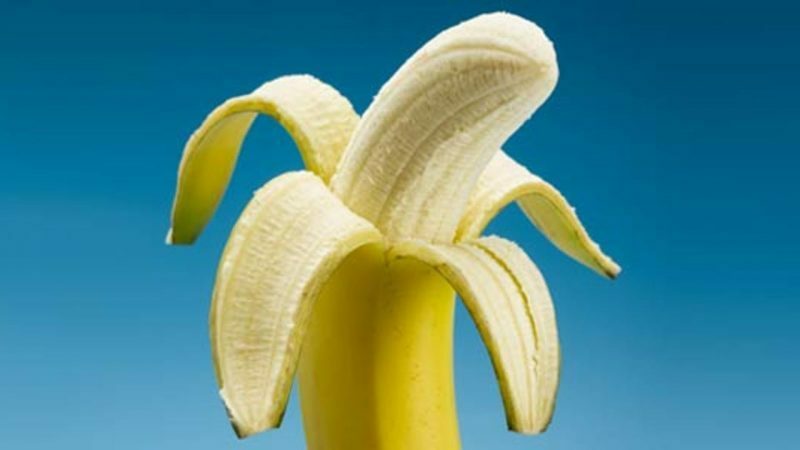 Because in this article you will know the complete nutritional information of the banana and in addition, you will remove the doubt if it is a fruit that fattens. You can not lose this! HOW MANY CALORIES IN A BANANA HAVE? Large banana (120 g): 109.35 calories. Medium banana (90 g): 82.01 calories. Small banana (60 g): 54.67 calories. protein: a large banana contains 1.3 grams of protein. So you can get an idea, a medium egg, which is considered the star food in terms of proteins, has four times more protein. Carbohydrates: let’s test it now for carbohydrates. A large banana contains about 27 grams of carbohydrates; of them, 3 gr are contributed by the fiber, 14 by the sugars and 6 by the starch. Minerals: although it is well known for its high potassium content, it is also rich in magnesium, manganese, potassium, and sodium. Vitamins: its most potent nutrient is vitamin B6, also known as pyridoxine. It serves to promote nerve function and prevent bone and cardiovascular diseases. Relieves constipation due to its high fiber content. As it is easily digested, it usually goes well in gastrointestinal processes. It fights stress and anxiety thanks to its content of vitamin B, which helps calm the nervous system. The potassium present in bananas helps reduce acne. The banana helps maintain concentration and attention. Are you still going to resist? Forget the legend of the caloric fruit banana and think that it is an extremely appreciated fruit both by athletes, by all the minerals it contributes, and by nutritionists. Food is the main factor in the actions of cancer prevention. In this sense, there are some types on which the composition of the banana could contribute to preventing it due to its richness in minerals and vitamins. In addition, the effect of high fiber intake can be very beneficial, and it can reduce the risk of colon cancer by up to 42% (the fiber content of a banana is 2.5 grams). It also helps to prevent stomach cancer (due to its high content of vitamin C), breast (thanks to its soluble fibers), pharynx and esophagus (for riboflavin), lung (the risk is increased in people with vitamin deficiency). A) and prostate (for vitamin E). Serotonin is a hormone directly related to mood: its decrease in the central nervous system causes anxiety, depression, aggression, anxiety, and obsessions. One of the ways to avoid this decrease is to enjoy good levels of L-tryptophan and potassium, elements that are found in high levels in the banana. In the field of sports performance, there are indications to evaluate this fruit as a recuperator after exercise and its consumption could be highly recommended in periods of high intensity. Although it is one of its most unknown benefits, the banana exceeds many fruits in terms of antioxidants. According to the index of ‘Oxygen Radical Absorbance Capacity’, which measures the antioxidant power of food, a banana has around 880 units, and the daily recommendation is between 3,000 and 5,000. Although there are no direct studies, three of the banana components are beneficial in the prevention of cardiovascular diseases such as diabetes, cholesterol or hypertension. Fiber, which reduces cholesterol levels and improves insulin sensitivity. Consuming 7 grams of fiber a day reduces the risk of suffering from this disease and this fruit contains three. Potassium, which balances blood pressure. The banana, the most important source of this mineral, contains 592 mg, while the banana 434/100 g.
Antioxidant vitamins. Carotenes, beta-complex vitamins, vitamins C and E make this fruit a great antioxidant that can help protect the body at the cardiovascular level and promote vasodilation. Thanks to the vitamins it contains, it can contribute to the proper development and functioning of the immune system through the synthesis of antibodies and increase the defensive mechanisms against bacteria. It is also considered that it can increase the immunological activity of lymphocytes and the synthesis of proteins that respond to viruses. On the other hand, polyphenols have a recognized microbicidal effect. Banana has traditionally been used topically to treat injuries and against diarrhea. Now we know the scientific reason for this custom: different studies suggest that plantain can reduce the formation of a free radical directly linked to cellular inflammation. Another study published in 2014 recommends including this fruit in the diet of patients with inflammatory bowel diseases. 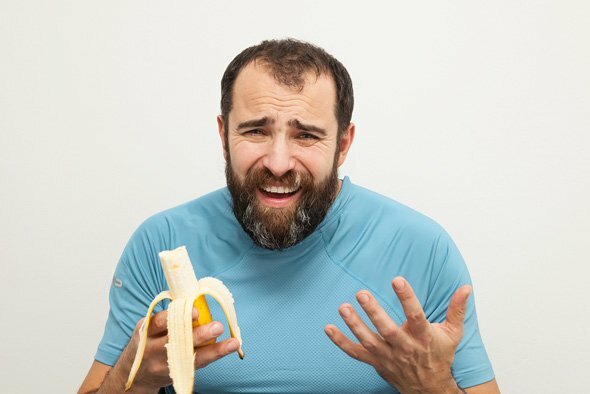 Banana consumption also has beneficial effects on the mechanisms associated with the hunger-anxiety cycle. On the one hand, it has a high content of pectin, a soluble fiber that increases the sensation of satiety. In addition, in the banana are hormones such as ghrelin (with a direct impact on the control of body weight) leptin, which helps reach the state of satiety and increases energy consumption. 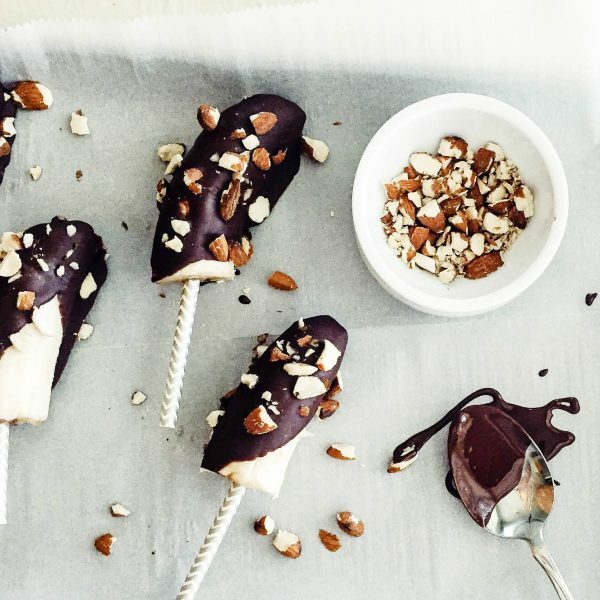 Banana is a fast food and easy to eat for themselves … But if you are looking for some more interesting ideas; here are some ways to incorporate bananas! 1) If you usually prepare shakes, bananas are an excellent ingredient to add if you are looking to thicken or add volume to the shake. Adding a banana will not only improve the flavor and thickness of your smoothie, it will also improve the macronutrient content. 2) Try slicing a banana on whole-grain toast (or any pancakes) for a pre-workout snack that will help maintains an increase in blood sugar levels while you train. Besides being very tasty it will help you to delay the appearance of exhaustion. 3) Add a portion of peanut butter to your banana for a slow release of healthy fats with extra protein and calories, after your workout, to help recovery. As bananas are composed primarily of carbohydrates, eating them with peanut butter will allow you to provide your body with a healthy portion of protein and fat. Pureeing perfectly browned and sweet bananas to use in your banana bread recipe might make you think you’re making a healthy treat. 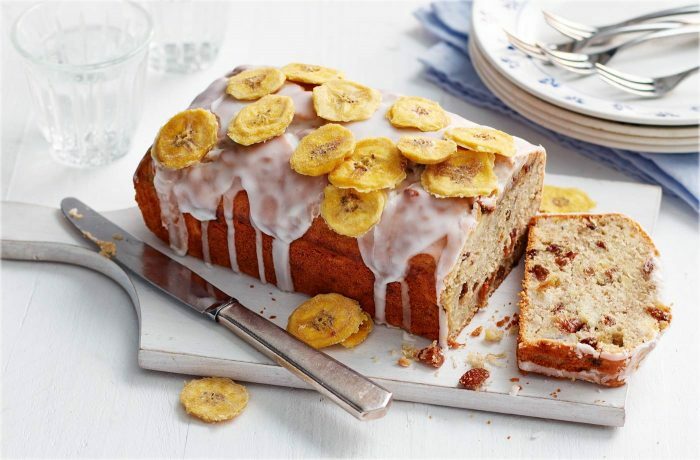 But when the bananas are mixed with all the other ingredients and become a perfect treat, you will have a piece of bread with lots of calories. A 2-oz. a piece of banana bread, weight about 70 grams contains about 200 calories. Almost banana bread one-third of the total, or 57 calories, come from fat; More than 65% of these calories, or about 130, come from the carbohydrates. The proteins that build the muscles mean a minimum of 6% of the calories, which is 10 calories of the proteins. The proper quantity of calories and macronutrient breakdown may change shortly depending on the ingredients you used in your specific recipe. If you’re thinking about of calories in bananas and milk, then a large banana is about 100-120 calories and 1 glass of low-fat milk is about 70-90 calories. So, a general banana milkshake would be about 170-190 calories. Now we know that the banana is a fruit with high protein and vitamin content, rich in different minerals, as potassium is one of its primary sources, besides it is very satisfying. and in the same way, milk has a high content of proteins, vitamins, and minerals, with calcium as one of its main strengths. Now if we join these two excellent ingredients, we will achieve great benefits, among them a high content of calories, potassium, calcium, and fiber, however, it is recommended that the milk consumed be skimmed which will minimize the possibility of improperly fattening. Due to its high protein content is one of the best shakes to increase muscle mass, as well as to provide the body with the necessary energy for its operation. Certainly, the union of these two ingredients, because it fills in a great way much today, is even part of the culture of some countries for example in Venezuela is called Camburada. The popularity of this shake goes beyond its high protein content. 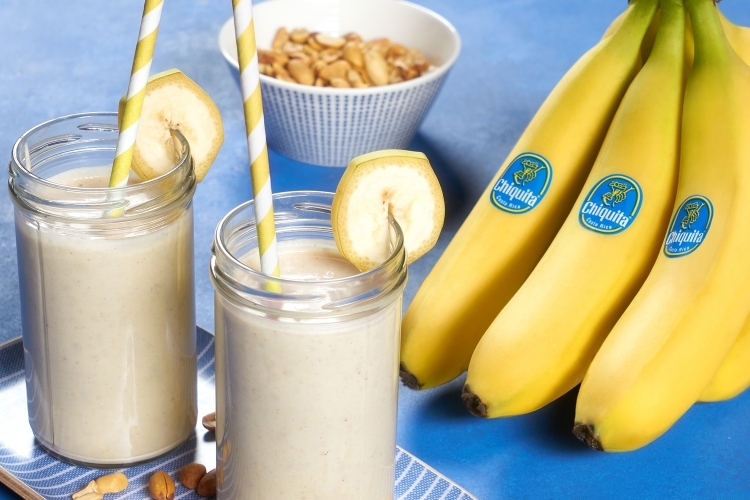 Then we can finally specify that combining the banana with milk is a shake with a large number of proteins that help to get the necessary amount of different nutrients for the day, because this refreshing drink is ideal for older adults, children, and adolescents. Its preparation is very simple, you only need two bananas and a glass of milk, place them in the blender with two ice cubes and after liquefying it, serve it and consume it. Remember to do it in the morning because at night, it will cause you to get fat. When people want to weight loss, the first advice they are given is to consume a large amount of fruit, where the banana, banana or banana depending on how it is known according to the region, is one of the favorite foods. We must consider that if we are on a diet and we go with a nutritionist, this specialist with certainty will suggest that we consume at least one banana every day, but no more than four. Despite the above, there are many people who think that this food can be used to weight gain, while others believe that it helps in weight loss. The mystery, in general, remains unresolved for those who do not have the necessary information. To understand the issue of the banana to lose weight, we must keep in mind that each banana contains about 100 calories, which is equivalent to almost 18 grams of carbohydrates. Carbohydrates are considered essential for the proper functioning of the body’s organs, however, when carbohydrates are consumed in excess, this can lead to an increase in our weight. This food is also rich in vitamins, minerals, and fiber, all nutrients that help us improve the metabolic rate. When the metabolic rate is increased, our bodies tend to lose weight automatically and generally faster if compared to the normal time that all this would require. This fruit also contains pectin, something that helps us feel fuller for a long period of time. The type of bananas that can help us lose weight: We must keep in mind that there are some types of bananas or bananas that help us lose weight faster. These types of bananas are also known as baby bananas, which are available in multiple countries around the world. This type of fruit is characterized by being shorter compared to traditional, but equally rich in vitamin B6 and fiber. Other types of bananas that help in weight loss are known as a banana donkey, red banana and the variety in general, which are available all over the world, but are more popular in certain regions, so some countries could be more find complexes. The popularity of these varieties is not as well known, due to the lack of information or because in some regions their value may be higher compared to the traditional variety. Better ways to consume bananas: Because we are talking about a delicious fruit, there are many ways in which we can consume it, for example, it can be mixed with many other fruits and consume a kind of fruit salad. You can also make a smoothie by mixing a banana with a low-fat yogurt. To lose weight, we must simply analyze how our regular diet is composed and see that high-calorie foods can be replaced by bananas or other fruit. The big key of everything seems to begin to change what is consumed. Tell us your opinion here. And you might inspire someone, or even inspire yourself. If you have any question about how many calories in a banana? Don’t forget this comment. Next Post:how to get fair skin fast permanently and naturally?